For the past month or so I’ve been having problems with what I first thought was my achilles but it would appear to be between the achilles and sticky out bit of the ankle. It’s quite difficult to pin-point as I can only really feel it when I’m running or slightly while walking. Possibly the posterior tibial tendon? The pattern seems to be: mild discomfort during run, a bit tender the next day and the day after that it’s fine. During the 10m race last Sunday I developed some tightness in my right calf (soleus?). Walking back to the car wasn’t much fun even though it was only 0.25m. I’m presuming these things must be linked. My legs were drained and tired up until Wednesday but I decided to take I an extra day off and went for a run on Thursday evening after work – just a little tester to see how my legs were feeling in general and to see how my ankle felt afterwards. 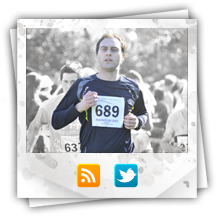 I could feel it during the run… quite uncomfortable but managed the 5k easily enough. In the morning the ankle was a bit sore but it eased within a couple of hours. By the time I’d got home from work I felt it was good enough run on. So last night I ran 6m at an easy pace with the ankle ache coming on between miles 2 and 4… with the last 2 ache free. hmm. I iced the area when I got home and today it’s feeling pretty much the same as yesterday… a bit stiff and sore coming downstairs early-on but it’s mid-day now and while it feels okay I can still “feel it” while walking. Tomorrow is supposed to be long run day and I’m due a 13-15 miler so I might have to cut that short. I shall see how it feels in the morning. This entry was posted on Saturday, September 10th, 2011 at 1:19 pm	and is filed under Aches and Pains, General Topics. You can follow any responses to this entry through the RSS 2.0 feed. You can leave a response, or trackback from your own site.